If you’ve ever searched the internet for online money making methods, then you’d know that Affiliate Marketing is a prominent way used by masses. And the other popular ones are Google Adsense, Cost Per Action (CPA), and Product Selling. Here are more ways to make money blogging. 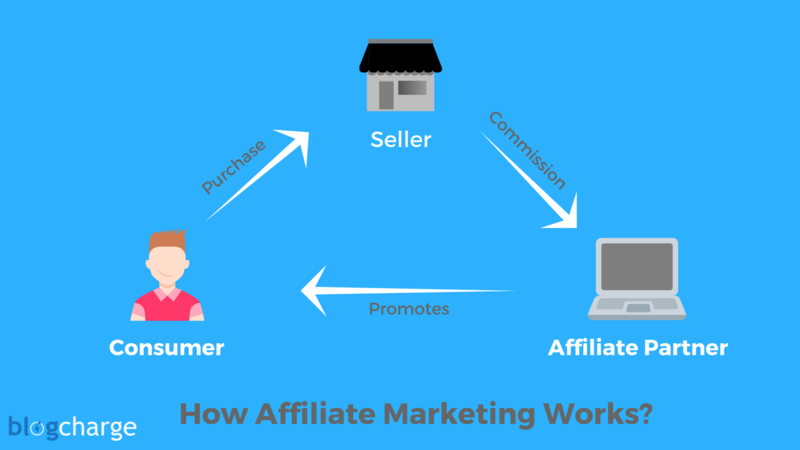 In affiliate marketing, you as a person, join a big network and promote their products to potential clients by means of internet. And for every sale you generate – tracked with a unique affiliate link – you earn a commission. The commission could be fix or tentative and varies from network to network. Affiliate Marketing is an easier way to get started with little to no investment and make money online as compared to the rest of the methods. For example, to earn a nice amount from Google, you need to have a huge traffic. And on the other hand, you can earn an equal amount of few hundred targeted visitors. While for product selling the margins and potential is high, the hard work (creating, designing, promotion) and investment is also high. But for affiliate marketing, you don’t need any of that. You can choose a product which is already doing great on the market and just promote it to others. As the product is already quite popular and trusted i.e. you don’t need to win the user’s trust from scratch, the chances of making sales are pretty good. Also, you aren’t the one responsible for providing after sale services including dealing with annoying customers. You enjoy your commission and enjoy your blessed laptop lifestyle. Is it that Easy to Earn from Affiliate Marketing? After reading the above paragraphs, you may have started waving the webs of your success and thinking about the color of your Lamborghini? Sorry to interrupt you, but you need to stop. While I said (and mean) affiliate marketing is easy, it is not fail-proof. In fact, around 90% of blogs never actually make decent money from affiliate marketing. What’s the reason you ask? Because they make stupid mistakes. A lot of them. There’s no blueprint for affiliate marketing. What works for me, may not work for you but there are common mistakes we both can make. In this huge post, I’m sharing 50 Affiliate Marketing mistakes I’ve personally made or saw someone making. The possible solution for the mistakes is also included. The list contains everything from choosing a niche to the domain name, web hosting to blog design, and affiliate network to link building. If you already have a decent website then you might want to skip earlier points and scroll directly to affiliate network part. Note: The solutions I have shared aren’t the only one available. You don’t need to blindly follow me, go ahead and try something new. Let’s dive into the huge list. If you find a category missing from the list, do let me know via the comments. Experts say affiliate marketing can work in each and every niche and I am not neglecting it. From food blogs to hobby blogs, each niche can be monetized with affiliate products. Yet there are few niches which are considered high paying and high converting. What happens is noobs with little to no experience always tends to read about these niches from expert bloggers, and without giving a second thought jump into the niche in the hope of making bank. Do they know about the niche or have prior experience with it? No. They can’t even write 20 articles about the topic without spending hours on Google and related blogs. And that’s why they are most likely to be failed and can’t compete against authority sites in the niche. Choose a small topic which you have an interest in and some prior experience. If you love fishing, then go ahead and choose fishing as your niche. Since you already know it, you won’t lose interest after time and will continue creating high-quality articles. Tip: Even if you’re planning to outsource content, it is suggested to first learn about the niche yourself and then go for hiring content. This way you know what type of content works for the niche and you’ll be able to give proper guidelines to the writer. There are few niches where readers are simply looking for some quick information and are not at all interested in buying a product. Although these niches may generate significant traffic, and work well with contextual advertising, it is safe to avoid the niches if your sole purpose is to make money through affiliate marketing. Look for niches with buyer intent search terms with a fair number of monthly searches. In particular go after the niche which has search terms containing ‘best’, ‘review’, ‘discount’, ‘coupon’, or related words. People like to their due intelligence before buying any product online, and this is where you can make a profit by providing them what they need – information about the product. But will the $1000 product able to compete with the crazy conversion of $50 air gun? Costlier products generally have better commission margins but their buyers are limited and people don’t purchase them frequently. On the other hand, products with average pricing have more regular buyers and they are affordable by a larger pool of people. To make $100, it will take only one sale from a product priced at $1000, and 10 sales from a product priced at $100 (considering a commission to be around 10%). However, the later one will be easier to achieve. Choose a niche with products priced around $50-$200 with good commission rate. Also, try to avoid seasonal products as their demands only increase in that particular season and for the rest of year, you’ll hardly see any visitors. Creating a site around products that are essential for daily needs is a good option for beginner affiliate marketers. There are tons of established affiliate sites making a good amount of money based on various niches. It is common for a beginner to think of replicating the success of those websites and start making money as soon as possible. The problem arises when he/she is not able to decide which site to replicate and keep switching between niches. It hurts the progress of each site and at the end of the day, no one gets profitable. Want to replicate someone’s success go for it, but do not keep jumbling between various categories or techniques by different Gurus. Stick to one niche, one strategy, and follow it until you make your site profitable. Stop only when you’ve made yourself a renowned name in that niche. The next essential step after settling down on a niche is to find keywords that you want to rank. Keyword research is of utmost importance as, without a list of good keywords, it would be nearly impossible to rank your site and get traffic. Below are few repetitive mistakes by beginners while choosing a keyword. Tip: I highly recommend KWFinder and SEMRush for keyword research. They will help you find rankable keywords without much manual work. But, don’t solely depend on them as I have explained below. It’s not bad to have few competitors as it sometimes implies that the niche may not be profitable at all. But if you’re targeting high competition keywords with your limited budgets then you better be sorry for your loss. Keywords with thousands of monthly searches (MS) will have established sites ranking for them on the first page of Google. It would not be feasible to for you to gain that kind of authority and outrank those sites. Hence, it is advisable to avoid such keywords and find keywords with enough MS but less competition. For example, the keyword ‘best WordPress hosting’ has a difficulty score of 61 which is considered as hard. Unless you have a budget and know SEO, it would be better to avoid this keyword and look for keywords below a score of 30. Spend some time lurking around and collect some seed keywords. Run them through KWFinder or SEMRush to find new less competitive long tail keywords. When a beginner starts an affiliate site, he will be more interested in targeting seed keyword which is competitive rather than doing research on long tail versions. Read this guide from Neil Patel to learn more about finding long tail search terms. Okay, I said you should make use of keyword research tools and now I’m asking you to not rely on them? Why so? Running a keyword through multiple tools gives you a general idea about competition, monthly searches, and if you stand a chance to rank for it. But every next tool you try will give you changing results which makes it hard to understand the true competition. Also, you can’t just take into account research by one tool, as it may not be 100% correct. That’s why I suggest people go for manual research as well. Search for the term in the search engine and go through first ten sites ranking on the first page. Readout few articles, their interlinking structure, content length, social shares, and backlinks pointing to that page. If you find sites with amazing content quality, proper on-page SEO, and links from authority websites then it would be wise decision to back off. On the other hand, if sites are small, with few articles, average on-page SEO, and a handful of links, then you can proceed with confidence as the sites will be quite easy to outrank. If you’re an affiliate of BlueHost Hosting and wish to rank for the term ‘Bluehost web hosting’, you better burn your wishes. For brand-specific keywords, the first few results will be of brand’s site only, while other would contain their social media pages, reviews by authority websites, and so on. Avoid wasting your time with brand specific keywords and focus on long tail versions such as ‘BlueHost hosting review’, ‘BlueHost vs SiteGround’, ‘Bluehost discount coupons 2017’, etc. 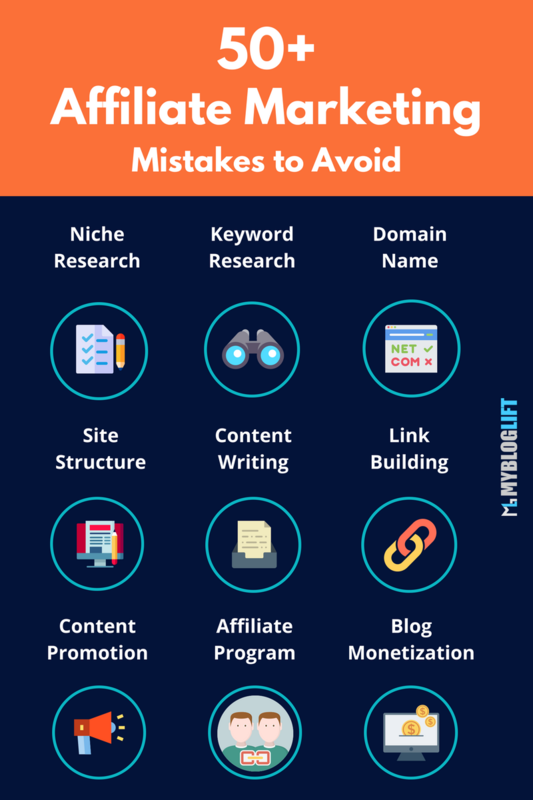 Now as you have a better idea of niche and list of keywords to target, let’s move on to the third category of affiliate marketing mistakes. After choosing a niche and researching for some rankable keywords, you would now set up a blog where you can promote your links to potential buyers. Choosing a domain name may sound like a catwalk, but trust me it’s harder than you think especially when expired domain names are involved. Here are few affiliate marketing mistakes related to the domain name. 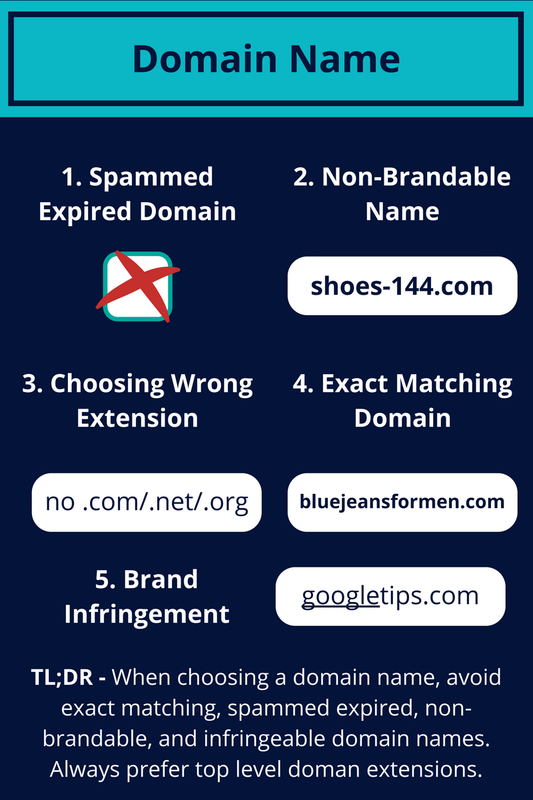 Expired domains with good metrics give an edge over a brand new domain name as you already have some established links. Also, expired domains have better DA, PA, TF, and CF as compared to zero. However, finding a good expired domain name that hasn’t already been registered is strenuous. There are people running bots to find good quality expired domains and quickly grab one as soon as available. It makes it even harder for us to manually check the metrics, past history, link profile etc. and then buy it. Even then it’s not guaranteed that the domain you bought will give you unexceptional results in SERPs. I prefer to buy from a reputed guy who has been in the business for long rather than wasting my time on searching through piles on expired domains and finding nothing but garbage. If you’ve no experience of expired domain names and want to start a new brand then stay out of this. If you’re interested in going this route, then read as much as you can on the internet, collect tools, and research properly before making the final purchase. Or if you can afford, just pay someone to do the heavy lifting for you. Your domain speaks for itself and if it’s catchy enough, it increases the sense of trustability among your readers. A domain with hyphens, numbers, and slangs looks plain stupid. On the other hand, domains with few letters, meaningful, and catchy are easy to remember and pronounce. Look at brands like SmartPassiveIncome, TechCrunch, AuthorityHacker which are killing the affiliate marketing space with their amazing brand names. Whenever possible, go for short, unique, and easy to remember brandable domain names. A good thumb of rule is to imagine your site being popular and all over the internet. Would you like it to be called men-shoes41.com? Tip: Use our list of brand name generators to hunt for a brandable domain name with ease. For instance, my blog has a .com extension. The popular ones (also called top-level domain) are .com, .net, and .org. But few other new extensions (.io, .co, .co.uk) are also catching up pretty quickly. There are hundreds of such extensions available to register. SEO advantages: For the majority cases, these popular extensions are ranked better on the search engines as they are considered standard globally. A country-specific extension will be ranked mostly for that specific country search results only. It leaves out masses of the internet users. No Confusion: It’s common for readers to just remember the name of the site and not its extension. And if they are telling someone about your site (with strange extension) then they are most likely to just tell the site name and not the complete URL. Now the referrer will either add a .com extension at the end (since it’s standard) or search for site name on the Google. If there’s a site with the same name as yours and .com extension, of course, it will be shown on the top of the page. Thus, transferring the traffic meant for you to the others. Stick to the standards and don’t opt for unrequired risks. Try to register your chosen name with top-level domain extensions only. It will also help in building a brand. Exact match domains were a hit in 2014-15. Many of the gray hat SEOs used this opportunity to register exact matching domains for their target keywords and got a significant boost in the rankings. For instance, if they’re trying to rank for keyword best juicers, they would try to buy bestjuicers.com/.net/.org which is an EMD. Top it with some content and links, and let the Google rank you on the first page. But does that work now? Sadly No. They might give you an extra boost if your content quality is superior, but most of the times, Google probably avoids ranking EMDs and in some cases penalize the sites. So, if you’re planning to buy an EMD, not going further and instead of looking for a more general name would be my suggestion for you. Being from a non-law background, we often don’t understand the seriousness of some actions. One such action is brand infringement in the domain name. You aren’t supposed to use any brand’s name in your domain name and if found, the brand can file a complaint against your site and get it down. And trust me, you can’t-do anything. The same is also stated in most of the affiliate program disclosures, so you may also not get approval. What’s next? 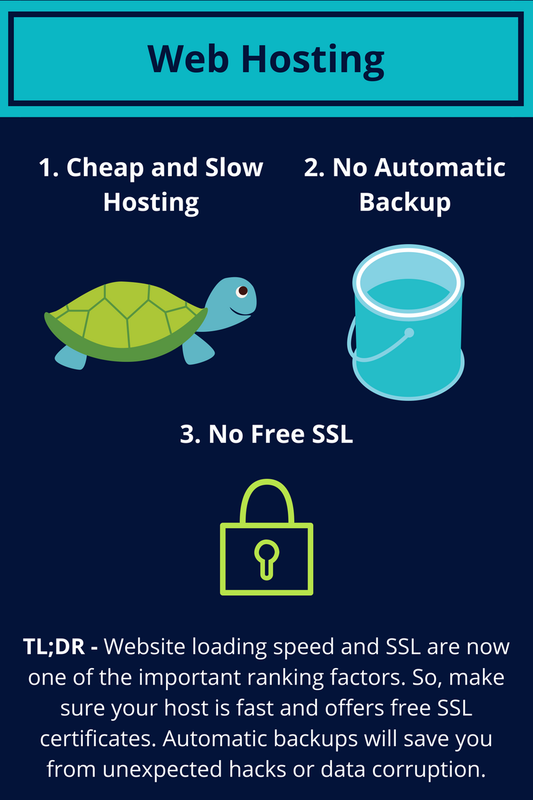 Hosting your website. There are various hosting providers available but not everyone can handle the needs of an affiliate website. With an affiliate website, our sole purpose is to bring targeted traffic and redirect them to the affiliated product’s page. Unlike a blog monetized with Google AdSense, we don’t need thousands of random users but hundreds of potential buyers. Also, we want our site to be available 24×7 so as to not lose a single conversion possibility. Here are few mistakes that one makes when choosing a web hosting service with a goal of starting a successful niche affiliate site. Saving money is essential and I truly support your desire to start your successful site for as cheapest as possible. But cutting back on something extremely necessary isn’t a good move for your future growth. Always buy web hosting from reliable providers which may look a bit costly but given their quality and support, they are worth the money invested. Also, a good web host makes sure your site is live for a maximum time and loads faster which in turn helps in better user engagement. You also don’t need to spend hundreds of dollars per month for hosting a starter affiliate site. We recommend starting with either InterServer or SiteGround shared web hosting as they are inexpensive and provide good quality and speed. Once you start receiving a good amount of traffic, switch to cloud hosting like CloudWays. Having a data backup stored in a safe place is one of the smartest things you can do. In case of some unfortunate situations, you can easily retrieve the data and get your site up and be working again. Therefore it’s important to either choose a hosting provider that offers automatic backup or learn how to manually backup your site yourself. SSL officially is a ranking factor now and you don’t want to be left behind. Installing an SSL certificate not only improves your rankings, but also boost reader’s trust. The cost of SSL varies from few dollars to few hundred dollars per year. But why to spend extra when you can get it for free? There are hosts like SiteGround and InterServer that offers free SSL for all domains hosted by them. The overall look, feel, and functioning of your site affects the user experience by a significant margin. Site structure can affect your site speed, responsiveness, search bots crawling, and user experience. But do we all know how to design a perfect website? No. So, here are few website structure related mistakes an affiliate marketer could repeat. Loading speed of your blog matters – the most. It has been proven that any page taking more than 3 seconds to load is a big NO in today’s age. A resource eating WordPress theme which makes tons of request to external services can affect your load time badly. Also, these themes have more than necessary features which sometimes can mess with the user experience. Achieving simple design and swift pages should be your ideal goal. Tip: Check out our list of recommended WordPress themes for personal blogs. If you’ve ever gone through a course/book on creating a niche site, you’d be familiar with siloing. 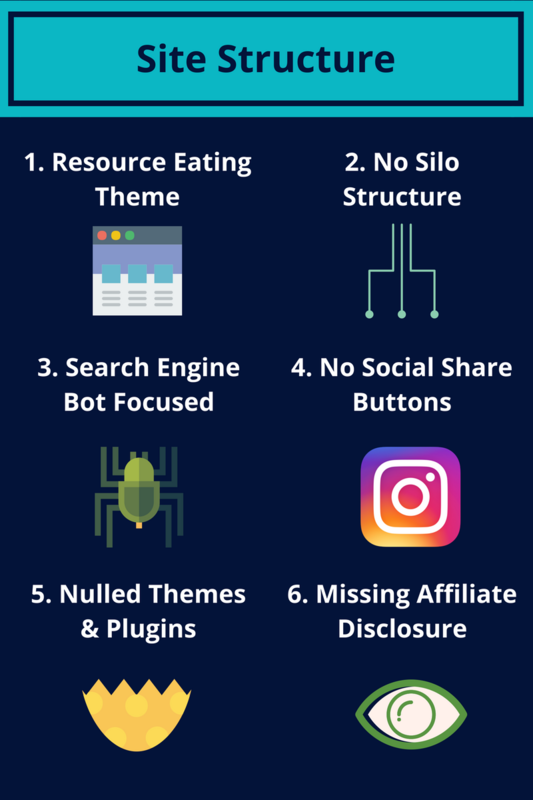 For those who didn’t, silo structure is a kind of deep structure which helps bots crawl your site easier and for readers to find a particular page with ease. In short, silo architecture helps you improve user experience (a ranking factor) and SEO efforts by organizing related information together. The below graphic explains the difference between flat architecture (used by the majority of sites) vs deep architecture. 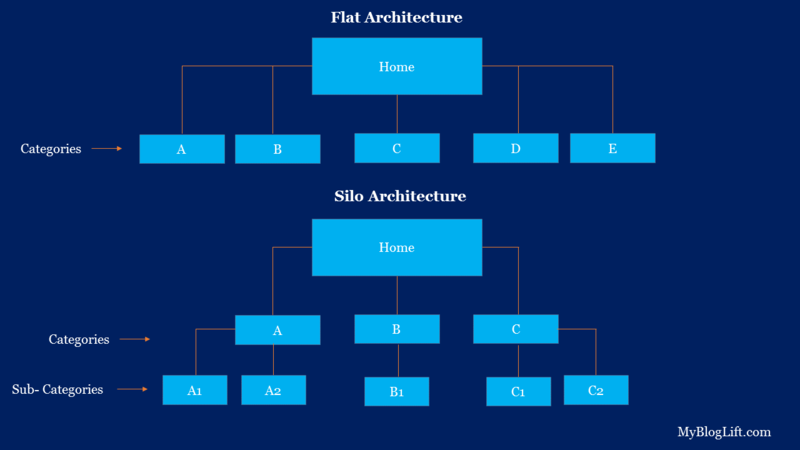 Read more about silo architecture and how to implement it with WordPress, on this page. The primary goal of your site should be to improve user experience and not to please search engine bots. That may sound like a piece of general advice, unfortunately, very few site owners follow it. There are few things which can please the humans and provide an excellent user experience. Website Theme: It should be simple, well formatted, and designed to look elegant in all screen sizes. Logo: Not a necessity but having a great looking logo can turn your one-time visitors into repeated ones. Color Combination: You can’t please every visitor depending on their color taste, but you can use a general color combination that looks easy on eyes. Sidebar: A sidebar containing nothing is better than having tons of ads and promotional banners. Many popular sites are getting rid of the sidebar to provide a clutter-free user experience, and I would suggest you follow the same. Blog Graphics: You may not be a great graphic designer, but that’s not an excuse to avoid images on your blog. Text with graphics are proved to be more user-friendly and also readers find it easy to digest visual information. What’s the point in creating share-worthy content if people can’t share it? Social shares give you more potential customers and free traffic. You can use any free social media sharing plugin to add those buttons to your blog. If I can save $10 by buying from a different store, I’ll do it. But when it comes to quality and safety of my blog, I don’t compromise. There are hundreds of sites that share nulled themes and plugins and you can find almost every damn product there. But, there’s no authenticity of it and you never know what kind of malicious code it could contain. With the help of that code, the hacker can get access to your site and steal important data before you get to know about it. If you can’t afford a premium plugin/theme, look for a free alternative. With thousands of free items available, I’m certain that you’ll find a similar product. You can use one of the top 10 personal blog themes, I shared earlier. It’s not there to help your readers but to save yourself from unwanted bans from the affiliate network. It is compulsory for affiliate marketers to disclose the fact that they’ve used affiliate links and failing to do so may lead to your account ban. Also, you may not get approved by an affiliate network without a proper affiliate disclosure, a majority of the approval process is (still) handled by a real person. The next thing you’d do is start creating content and publish it on your freshly created blog. But, there are few possible mistakes you’d want to avoid. Content is the king and Quality Content is the emperor. The rankings of your site partially depend on your article quality and how much information you provide. 1000’s of high-quality links are of no use if your article is spun or provide nothing to low value. Long-form contents are the new best way to get higher rankings, social shares, and backlinks based on the fact that it contains in-depth information about a topic. Since it’s important, it’s natural for you to make mistakes while creating content. Unless you run a news website where fastest update means a lot of traffic, you shouldn’t focus on writing too many articles. For niche blogs to be monetized with affiliate marketing, quality matters a big time. Your articles will be read by potential buyers and you’ve to convince them to finalize their purchase with the help of your copywriting skills. Despite the fact that Mr. Dean has around 25 articles posted on this blog, he generates hundreds of monthly page views and a possible affiliate commission better than the most. He writes only in-depth guides which averages to be around 2k-3k words long and his posting frequency is lesser than one post per week. According to SearchEngineLand, 88% users trust online reviews as much as they do with a personal recommendation. Affiliate product reviews are the easiest and working method to generate sales and earn a commission. But is doing a feature based review the correct way? Does that convince your readers to make a purchase? Unless you can show the reader that you’ve actually used the product/service and know what you’re writing, it’s difficult for them to believe you after reading a generic product review talking about the features. Need a helping hand? 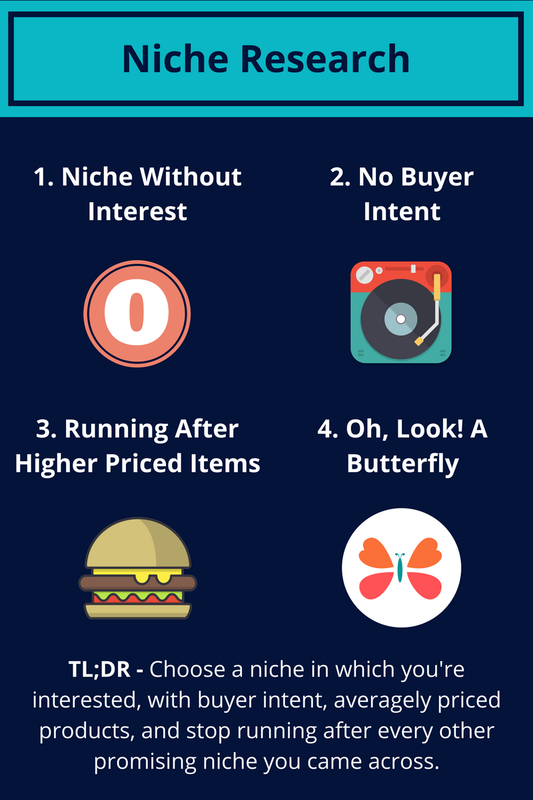 Read out this guide from NicheHacks before you sit to write the next affiliate product review, and see the difference yourself. Similar to brand infringement, using copyrighted images may also lead to a legal action against you. But what if I give proper credits? For some sites, it’s okay to use and give proper credits, but for others, you can still land into a legal trouble. Using images from Google Image Search results is not a wise idea and if you do, you can get a legal notice one day. You must be familiar with the story by Roni Lauren, who got sued for using a copyrighted image by mistake. I have already shared a list of 50+ free places to find copyright-free HQ blog images, you might need to bookmark that post. While you can improve your chances of conversion by highlighting features of a product, it looks biased if you are just writing about the good things. A product review should be helpful and cover all the aspect of the product, both goods, and bads. It makes your review look unbiased and the visitor will trust your review to finalize his/her purchase. On the other hand, if you are being salesy and biased about the product features, it’ll hard for the reader to make a final call and he would prefer to read the review on another site. SEO is like salt in a recipe. Neither it can be less nor more than the required quantity, otherwise, it can ruin the complete recipe. Many of the new bloggers don’t understand the risk of over-optimizing their articles, thus leading to penalties by search engines. 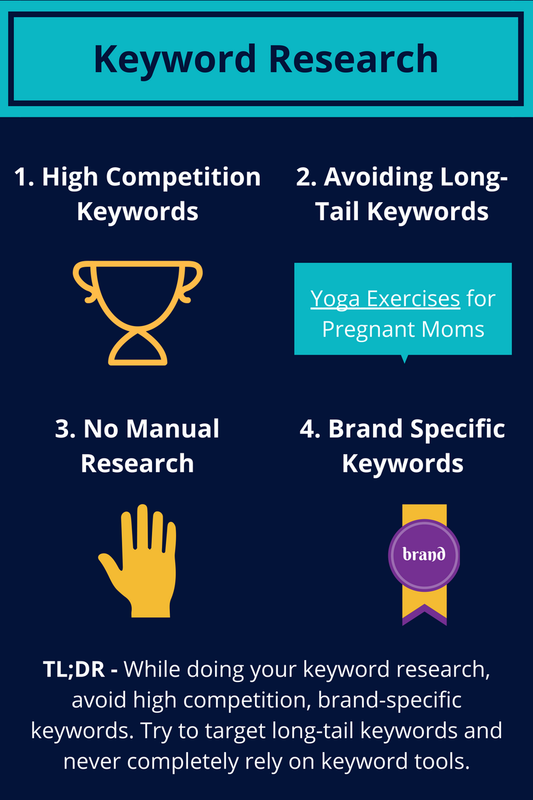 There is no exact percentage of keyword density, but I suggest to keep it natural and try to play with long tail keywords rather than repeating your target keywords again and again. Also, the images, links to external sites, heading structure should be proper. Stay tuned as I’ll soon launch a mega guide on On-Page SEO to help you optimize your blogs better. Interlinking is when you link your own articles to your new post with suitable anchor text. However, the ratio of internal links and external links should also be maintained. And if possible, try to use the long tail keywords for interlinking. I have already talked about the importance of cloaking affiliate links and how to properly do it, in this post. Refer to the above post and make sure you do not skimp it. Don’t forget to subscribe to our blog and get an update when the part two goes live. Also, make sure to leave a comment and share your biggest affiliate marketing mistakes. And lastly, share this post with your friends and followers. 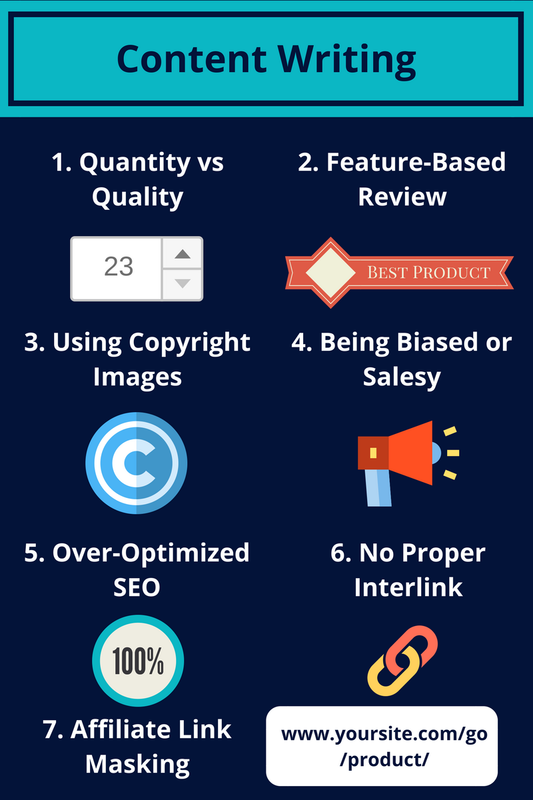 Thanks for the wonderful list of affiliate marketing mistakes. This is one of the best post that I read in the recent times. Wow, You just nailed it, man, its really helping me a lot, I bookmarked your site and suggested for my friends to know about their mistakes, keep sharing with us, looking forward to more information like this. hi thanks for this article, i am site designer and it’s useful for me. i’m sharig this. Awesome. Thanks for good words.